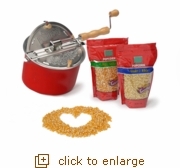 This gift set is perfect for the popcorn lover in your life. Barn Red Whirley Pop: Make delicious popcorn in style. The patented stirring mechanism helps to ensure each kernel pops. 2 Pound bag of Tender and White Kernels: A medium sized mouthwatering, tender piece of popcorn. This is sure to become a favorite. 2 Pound bag of Big & Yellow Popcorn. Best described as "movie style" this yellow popcorn has a lot of crunch.